AC power, fluorescent lighting, wireless telecommunications and digital computing, these are all familiar and vital components of life as we know it in the twenty-first century and all were contributions of the prolific inventor Tesla. In spite of their exceptional significance, there are additional inventions that this remarkable man left to the world with the capacity to be of an equivalent or perhaps even greater value to society. Much of Tesla's legacy, that which can be read about, built and used, is in the form of these inventions—much but not all. Near the North Shore Long Island community of Shoreham, New York there exists a sturdy 94 by 94 foot red brick structure that is another, no less significant reminder of this great man's work. Its importance lays not so much in the technology that it represents or in the engineering clues that remain buried there. It is in the fact that the Wardenclyffe Power Plant / Office Building, designed by the well renowned architect Stanford White, is the last of Dr. Tesla's own work places to remain standing anywhere in the world. The saga of the building's history, from its construction in 1902 alongside a 187-foot companion tower to house the various components of a prototype world broadcasting and telecommunications facility to later less glamorous uses, is a story yet to be fully told. And, there is history in the making as well. For a movement is underway which, if successful, will result in the establishment of the Tesla Science Center at Wardenclyffe—a permanent monument to this great creative genius and his work. Figure 1. 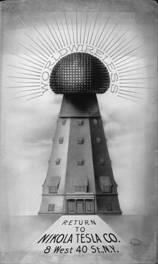 The Wardenclyffe facility for worldwide broadcasting and wireless telecommunications. Just to the east of Manhattan, Tesla's principle place of residence from 1884 until his death in 1943, is another somewhat larger body of land known as Long Island. Extending about 115 miles along the Atlantic shoreline of the United States, this 12 mile wide island is bounded by Long Island Sound to the north, and the East River, New York Bay and the Narrows to the west. It was formed due to the effect of glaciations, with its geography being defined by the deposition of two glacial moraines and associated outwash plains. Settlement of the area started in the late 1600s and continued on through the year 1800, after being purchased from the indigenous people known as the Montauks. The occupations of the residents were mainly related to farming, a character that the area retains to this day. A cordwood industry eventually developed as well, with logs of chestnut, oak and pine being shipped by sailing vessel to heat homes and fuel brickyard kilns in nearby New York City. Around 1850 the effects of an increasing demand for fuel along with a chestnut blight combined, resulting in forest depletion. The introduction of coal as wood's replacement occurred at the same time. About 50 years later, having just returned to New York from a productive scientific expedition at the edge of the Colorado Rockies, Tesla was anxious to put a mass of newfound knowledge to work. His vision was focused on the development of a prototype wireless communications station and research facility, and he needed a site on which to build. Long Island was already home to more than one-and-a-quarter million people when in 1901 he cast his eyes some 60 miles eastward to the north-shore village of Woodville Landing. Only six years before the northern branch of the Long Island Railroad had opened, reducing travel time to the locality from a horse-drawn five hours to less than two. Seeing an opportunity in land development, a western lawyer and banker by the name of James S. Warden had purchased 1400 acres in the area and started building an exclusive summer resort community known as Wardenclyffe-On-Sound. With an opportunity for further development in mind, Warden offered Tesla a 200-acre section of this parcel lying directly to the south of the newly laid track. It was anticipated that implementation of Tesla's system would eventually lead to the establishment of a "Radio City" to house the thousands of employees needed for operation of the facility. The proximity to Manhattan and the fairly short travel time between the two, along with the site's closeness to a railway line must have been attractive features and Tesla accepted the offer. 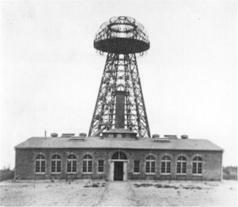 The Wardenclyffe World Wireless facility as envisioned by Tesla was to have been quite different from radio broadcasting stations, as they presently exist. While there was to be a great similarity in the apparatus employed, the method in which it was to be utilized would have been radically different. Conventional transmitters are designed so as to maximize the amount of electromagnetic radiation emitted by the antenna structure. For long-range communications such equipment must process tremendous amounts of power in order to counteract the loss in field strength (P = 1/R2) encountered as the signal radiates outward from its point of origin. The transmitter at Wardenclyffe was configured so as to minimize the radiated power. The energy of Tesla's steam driven Westinghouse 200 kW alternator was to be channeled instead into an underground structure consisting of iron pipes driven from a point 120 feet beneath the tower's base. This was to be accomplished by combining an extremely low frequency signal (ELF) along with the higher frequency current coursing between the earth and the transmitter's elevated terminal [through the master oscillator and helical resonator]. 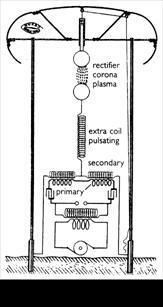 The low frequency current in the presence of an enveloping corona-induced plasma of free charge carriers would have "pumped" the earth's charge. It is believed the resulting ground current and its associated wave complex would have allowed the propagation of wireless transmissions to any distance on the earth's surface with as little as 5% loss due to electromagnetic radiation. 7. Remote control and propulsion of UAV "atmospheric satellites" in long duration flight. 8. Wireless transmission of electrical energy for propulsion of aerial and other vehicles, and industrial purposes. 15. Interplanetary Communications providing a stable, high-capacity interplanetary network backbone supporting high-speed Internet protocols. The design of Tesla's World-System installation can be traced back to 1892 and his preliminary investigations at the 35 South Fifth Avenue lab. 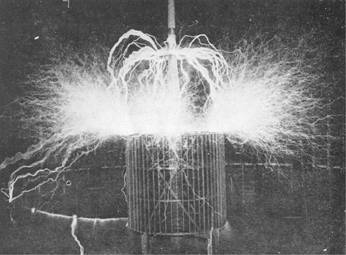 In Tesla‘s words, “The first gratifying result was obtained in the spring of the succeeding year, when I reached a tension of about 1,000,000 volts with my conical coil.” Further development took place in his Houston Street lab where he achieved potentials of 4,000,000 volts with a larger flat-spiral coil. He made observations related to selective tuning, developing techniques for spreading the transmitted RF energy in both the frequency and time domains -- spread spectrum transmission. I have just returned from Colorado, where I have been carrying on some experiments since a few months past. The success has been even greater than I anticipated, and among other things I have absolutely demonstrated the practicability of the establishment of telegraphic communication to any point on the globe by the help of the machinery I have perfected. Tesla’s short-term goal was to build a prototype world-system communications facility. This was intended as the first of many wireless plants that would be located near major population centers around the world. If the program had moved forward without interruption, the Long Island prototype would have been followed by additional stations, the first being built somewhere along the southern coast of England. By the Summer of 1902 Tesla had shifted his laboratory operations from the Houston Street Laboratory to the rural Long Island setting, and work began in earnest on development of the plant. The building was essentially completed and octagonal wooden tower had taken form. A 200 kW Westinghouse alternator was installed to power the system, with four large oil filled transformers as the high voltage supply. Four additional steel tanks contained condensers, and another a set of regulating coils. Designed by Tesla and Westinghouse engineers, two of these complex units were assembled. One was delivered to Wardenclyffe and the other was warehoused, presumably for future delivery to the second installation to be built across the Atlantic. 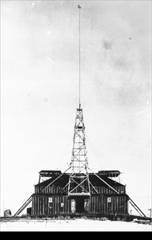 In 1903 the 187-foot tower framework was topped off with a 68-foot diameter, 55-ton terminal capacitance. A graphic rendering by artist Frank Paul, shows final appearance of the massive structure had it been completed. In July 1903 Tesla began testing the system. Judging from his letter of November 5 to J.P. Morgan he was not at all satisfied with its performance. Figure 3. A scale comparison of the Colorado Springs Experimental Station and a Wardenclyffe-type installation. Another “defect" of the Colorado Springs plant could have been the plan that involved coupling by corona discharge between the extra coil and the conducting hood that Tesla had installed at the lower end of the insulated metal tower (see CSN pp. 197, 334, Phot. X for example). Figure 4. Colorado Springs Notes, pp. 197, 334, Phot. X. Additional problems may have included the ‘antenna’ feed point (see CSN, pp. 170, 197) and the shallow Colorado ground plate verses the 300-foot long section of pipe at the bottom of a 120-foot deep shaft [see The Connection to Earth]. 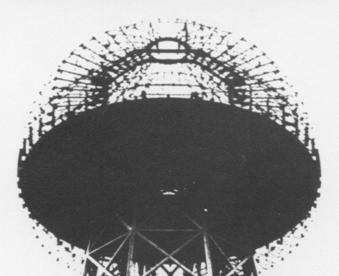 In spite of these and some additional shortcomings, the Colorado apparatus served as an effective test bed for experimentation with various transmitter configurations. Six different arrangements were developed, and are shown in the Colorado Springs Notes on pages 190 and 191, and also a reproduction of Tesla’s original lab note on page 200. It seems that Tesla felt the arrangement illustrated in figures 5 and 6 was the most promising. It shows up with slight variations at a number of places in the Colorado Springs Notes, most significantly on pages 191, 200, 197 and 170 (see also pages 161, 162, 174, 177 and 184). In the corresponding text on page 191 Tesla writes, "In Fig. 5. & 6. it is found best to make [the] extra coil 3/4 wave length and the secondary 1/4 for obvious reasons." 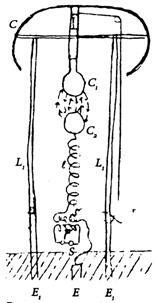 In the May 29, 1901 note Tesla wrote of the Wardenclyffe Design, "The length of conductors in the free system [equivalent to the 3/4 lambda extra coil in figure 5/6 CSN p. 191/200] should be lambda/4, and the length of the discharging circuit [equivalent to the 1/4 lambda secondary in figure 5/6] should be 3/4 lambda or n/4 lambda [“n” could be very large reflecting the wavelength of the superimposed ELF excitation. [?]] eventually, n being an uneven number." Figure 2. One of the transmitter configurations illustrated in the Colorado Springs Notes (figure 5, p. 191/200). Figure 4. 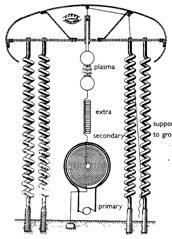 Another rendering (from an unknown source) of the transmitter configuration illustrated in figure 6, pp. 191, 200 of the Colorado Springs Notes. A receiving circuit is standing out to the right. Figure 5. 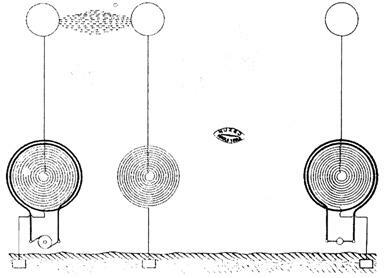 Two design drawings, with variations, of the initial Wardenclyffe transmitter. Tesla calculated the legs would have to be at least 600 feet in length. Notice the alternator-driven discharge circuit and the adjacent free oscillatory system. Figure 6. Modified Wardenclyffe transmitter design. In figure 6 the straight conducting legs have been modified to a spiral form. An obvious advantage would be a reduction in the structure’s overall height above ground level. Also notice that the number of turns varies from leg to leg. This would also result in the development of a higher order wave complex by the transmitter—a form of frequency-division multiplexing. While it’s possible the dual-tower transmitter design might be made to work properly, it is clear from his experiments with the 1899 through 1901 configuration culminating with the dismal performance displayed during the July 1903 operational tests that he experienced extreme difficulties with its single-tower implementation. Getting back to the "remedies" in the letter to Morgan, protected in applications filed between 1900 and 1902, and "still in the office," the only patented invention meeting these criteria is APPARATUS FOR TRANSMITTING ELECTRICAL ENERGY, No. 1,119,732, issued Dec. 1, 1914. Comparing the two basic circuits the most obvious difference is the elimination of the stand-alone extra coil or free oscillating system and the plasma coupler [C/S #6]. The entire transmitter is now comprised solely of the discharging circuit—an oscillatory transformer with an extra coil connected directly to the elevated terminal. The considerable distance (about 350 feet) between the high-voltage power supply transformers and the tower-side components, including, at the very least, a helical resonator, could have been a problem on Long Island. Two other seemingly applicable patents filed for within the specified time period and patented in 1900 are “Means for Increasing the Intensity of Electrical Oscillations,” No. 787,412 and “Method of Insulating Electrical Conductors,” No. 655,838, reissued as No. 11,865. Both of these inventions might have been useful for improving the Wardenclyffe plant's performance; the first for the magnifying transmitter itself, the second for improving high-voltage power transmission between the lab building and the tower structure. Figures 8a & 8b. Two views of the Wardenclyffe tower cupola. Two other seemingly applicable patents filed for within the specified time period and patented in 1900 are “Means for Increasing the Intensity of Electrical Oscillations,” No. 787,412 and “Method of Insulating Electrical Conductors,” No. 655,838, reissued as No. 11,865. Both of these inventions might have been useful for improving the Wardenclyffe plant's performance; the first for the magnifying transmitter itself, the second for improving high-voltage power transmission between the lab building and the tower structure. History of Shoreham, Mary Lou Abata, 1979. Tesla On His Work With Alternating Currents and Their Application to Wireless Telegraphy, Telephony and Transmission of Power, L.I. Anderson, Sun Publishing, Denver 1992. "Spherical Transmission Lines and Global Propagation," K.L. Corum and J.F. Corum, Proceedings of the 1996 International Tesla Symposium, Colorado Springs, Colorado. “My Inventions,” Tesla, Electrical Experimenter, 1919. . . .
 Vojin Popovic, "Tesla the Founder of Radiocommunications," Tesla--Life and Work of a Genius, Yugoslav Society for the Promotion of Scientific Knowledge, Belgrade, 1976. "Wardenclyffe, Forfeited Dream," Leland I. Anderson, Long Island Forum, Aug., Sept., 1968. Tesla On His Work With Alternating Currents and Their Application to Wuireless Telegraphy, Telephony and Transmission of Power, Leland I. Anderson, editor, Twenty First Century Books, 2002. Anderson, Leland I., Rare Notes From Tesla On Wardenclyffe, Electric Spacecraft Journal, Apr./May/June Issue 26, Sept. 14, 1998. [ ] Prodigal Genius — The Life of Tesla, John J. O'Neill, Ives Washburn, Inc., 1944. [ ] Anderson, Leland I., “The Silent Tower,” The Old Timer’s Bulletin, (Antique Wireless Association, Inc.) Autumn (Sept.), 1968. [ ] Tesla--Colorado Springs Notes, 1899-1900, Tesla Museum, 1987. [ ] Tesla — Man Out Of Time, Margaret Cheney, Prentice Hall, 1981. [ ] "Sale of Nicola Tesla Property Recalls Stories of Aged Inventor," Brooklyn Eagle, April 24, 1939. [ ] "Radio Pioneer at Shoreham," Thomas R. Bales, Patchogue Advance, Sept. 13, 1951. [ ] "RI/FS Work Plan," Groundwater Technology, Sept. 30, 1993. [ ] "In Recognition," Brookhaven Bulletin, July 12, 1976. No. 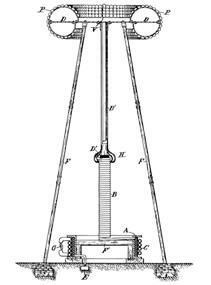 613,809, "Method and Apparatus for Controlling Mechanism of Moving Vessel or Vehicles," Nov. 8, 1898. No. 645,576, "System of Transmission of Electrical Energy," Mar. 20, 1900. Nos. 685,953, 685,954, 685,955, and 685,956, Nov. 5, 1901, on utilizing effects transmitted through natural media. No. 723,188, "Method of Signaling," Mar. 17, 1903. No. 725,605, "System of Signaling," Apr. 14, 1903. No. 787,412, "Art of Transmitting Electrical Energy Through the Natural Mediums," Apr. 18, 1905. No. 1,1191,732, "Apparatus for Transmitting Electrical Energy," Dec. 1, 1914. Some of Tesla's inventions have long been accepted as part of daily life, for example AC power, broadcasting and, more recently, high frequency lighting. And, Tesla turbo-machinery are just now beginning to see some use, especially in the industrial arena. This is not so much the case with Tesla's more advanced concepts. The proposed "World System" is a prime example. Here is a major invention in which Tesla held total confidence regarding its performance characteristics were it to become fully operational. Was Tesla entirely correct? If so, what would be the ramifications associated with the system's full-scale implementation? Would responsible operation have been possible or even probable at the beginning of the last century? Even now, could the system gain acceptance from society, in spite of what might be perceived as less-than-desirable characteristics, i.e., its potential as a weapon of mass destruction. It has been said the prototype plant was intended as the first installation in a global power distribution system. Actually, it was intended to serve as the western component of a trans-Atlantic wireless telecommunications link. It is possible the modified dual-tower design was experimented with at Wardenclyffe, some time between June 1901 and Nov. 1903, as progress with the tower's construction allowed. In any case, the letter suggests the 1901 scheme was fatally flawed. “. . . A plant was built on Long Island with a tower 187 feet high, having a spherical terminal about 68 feet in diameter. These dimensions were adequate for the transmission of virtually any amount of energy. Originally, only from 200 to 300 K.W. were provided, but I intended to employ later several thousand horsepower. 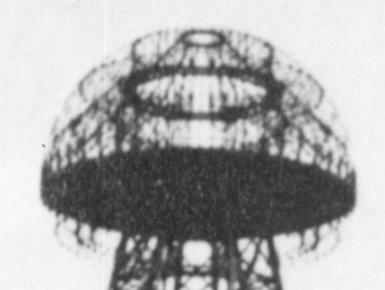 The transmitter was to emit a wave-complex of special characteristics and I had devised a unique method of telephonic control of any amount of energy.